Have trouble remembering names, birthdays and other important stuff about people you care about? Then 'What's my name?' is what you got to try! 'What's my name?' 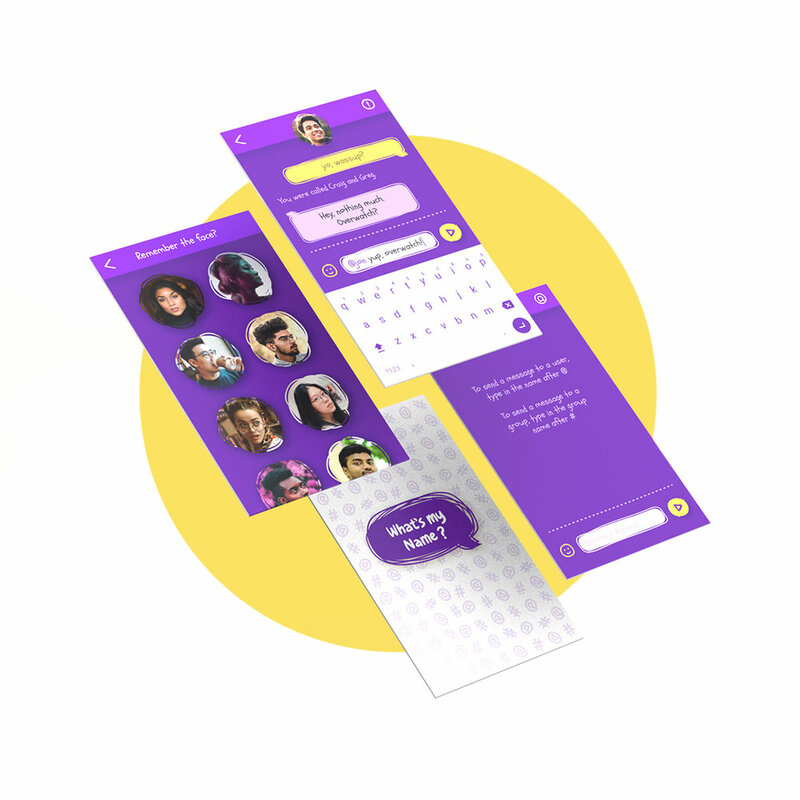 is a messaging app that helps user get familiar with their friends and colleagues through an uncomfortable experience, so as to feel confident and comfortable with the people around them quicker than usual. 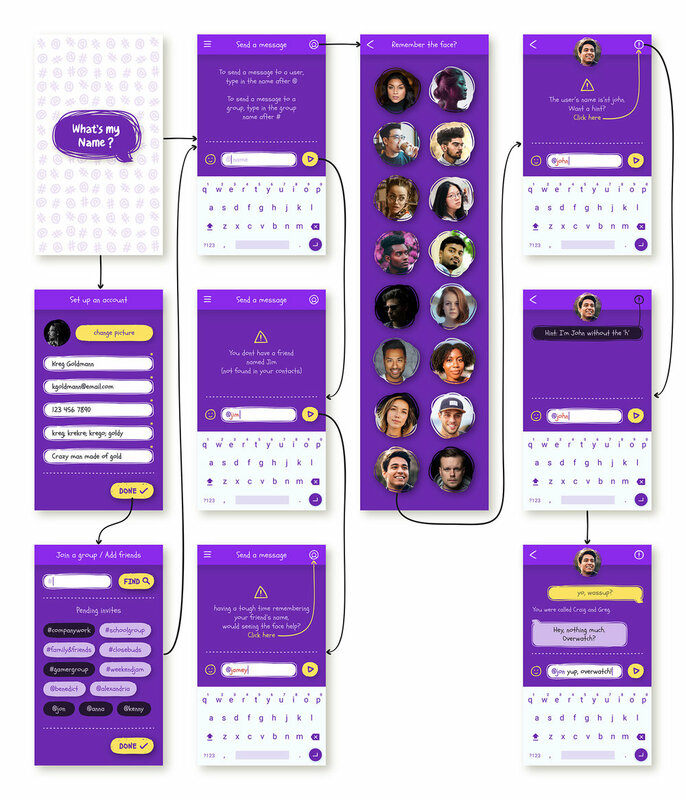 Design an app that makes user remember names and information about their friends or colleagues, through a discomforting experience. There are apps that help user store information (eg: google keep), or memory training apps (eg: like lumosity) that help user remember things through mnemonic methods. But most of us use messaging apps (eg: Slack, FB messenger) on a daily basis to communicate with friends or colleagues. Feels embarrassed when he cannot remember names of his colleagues. To figure out a way to remember the names of his colleagues as soon as possible. Cannot recall names of her international schoolmates, hence feels hesitant to approach them. Wants to be confident and outspoken while networking in school. This project was a part of a digital art experiment to see how discomforting experiences might help users in the long run to overcome some form of intimate or visceral feeling they might have in a social or cultural situation. In this case 'problem remembering names' was one of the key discoveries made during the discomfort matrix research. Mnemonic device techniques are most common memory training methods used by people who want to quickly memorize a large quantity of information. This app's experience is designed to make the user go through a cognitive journey that forces the brain to rehearse and recollect, which might be discomforting for some users, and even time consuming for some. But after the first use, it becomes easier to use as the user remembers the experience very well. This is not an app for daily use or for everyone. It's an alternative for people who wish to know more about other people they interact with.